Designed as part of the General Services Administration (GSA)’s Design Excellence Program, the San Francisco Federal Building consists of an 18-story tower of reinforced concrete, a four-story steel braced frame annex building, and a standalone pavilion for a restaurant. To support the GSA’s commitment to incorporating energy efficiency and sustainability, the team proposed a design based largely on energy reduction through natural ventilation, taking advantage of the temperate Bay area climate. Exposed thermal mass was required to supplement the natural cooling, absorbing heat from computers, people and lighting. A solution of upturned beams creates an unobstructed soffit, across which air flows unimpeded, promoting heat transfer. The ribbed slabs that span between the upturned beams have a wave profile varying from 12-5/8 to 4-3/4 inches to reduce mass, increase air contact surface area, improve lighting by eliminating shadows and enhance the spaces aesthetically. At night, computer-controlled windows behind the scrim open, allowing the evening air to flow through the building and cool the concrete. A narrow 20-meter floor plate allows for wind-driven natural ventilation. A thinned slab at the perimeter edge maximizes window height assisting with daylight penetration. The project’s tower building consumes 33 percent less energy than a conventional office building design under the same California energy code. 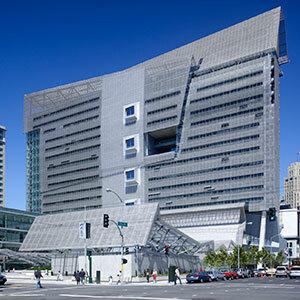 The San Francisco Federal Building set a precedent for high-performance, design-driven government buildings in the US and beyond. Its legacy holds governments to account for developing and operating real estate that reflects their citizens’ values of quality design and protecting the environment.